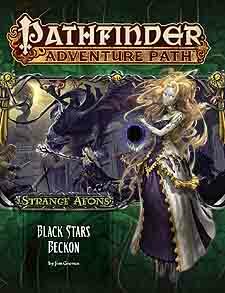 The Strange Aeons Adventure Path draws to a stunning conclusion! Arriving in the alien metropolis of Carosa, the adventurers must sever the links that bind it to Golarion. In wandering the parasitic city, the characters navigate frozen elder thing ruins, deal with accursed partygoers in a reflection of an Azlanti city, and encounter a mute musician who can help them find their way through the maddening and monster-infested streets. Can the heroes keep Carcosa from drawing Thrushmoor into its amalgam of stolen cities or do they risk waking the unspeakable nightmare that stirs in the depths of Lake Hali? They must do what it takes to break these links - or Golarion is doomed to greet the King in Yellow. "Black Stars Beckon," a Pathfinder adventure for 15th-level characters, by Jim Groves. Advice and suggestions on how to expand your campaign beyond this Adventure path's conclusion, including a system to bring your Pathfinder character to a whole other world, by James Jacobs. An unsettling interrogation and a troubling revelation in the Pathfinder's Journal, by Adam Daigle. A bestiary containing a new Great Old One and other loathsome monsters, by Benjamin Bruck, Jim Groves, and James Jacobs.